We can see rain and snow, but that’s not the case for the biggest cause of water loss practically everywhere in the world: evapotranspiration. Reliable figures for this invisible water loss are lacking primarily because evapotranspiration is so hard to measure. Thanks to the effort of knowledge institutions, business and government, a new measurement apparatus has been developed within TKI Water Technology. The first version of this apparatus was installed in a monitoring station in the De Hoge Veluwe National Park. On Wednesday morning, 16 September 2015, the monitoring station was festively commissioned after the conclusion of the well-attended symposium: ‘Where does the water go?’. The evapotranspiration figures produced by the apparatus are of great importance for water management. A lot of research has been conducted in the Netherlands over the past few years into evapotranspiration, and much progress has been made in its measurement in the field and in modelling it with hydrological models. ‘Nonetheless, a long road still lies ahead,’ says KWR’s CEO Wim van Vierssen. ‘We would like to have a spatial image of the evapotranspiration to allow us to use targeted management when implementing measures in the landscape.’ In the Veluwe, for instance, the transformation of coniferous woods into drift sands would increase the groundwater recharge five-fold. A necessarily rough estimate (reliable figures are lacking after all), indicates that this measure would yield a good 4 million litres of water per hectare every year. That’s the same quantity that 80 people consume from their taps annually. 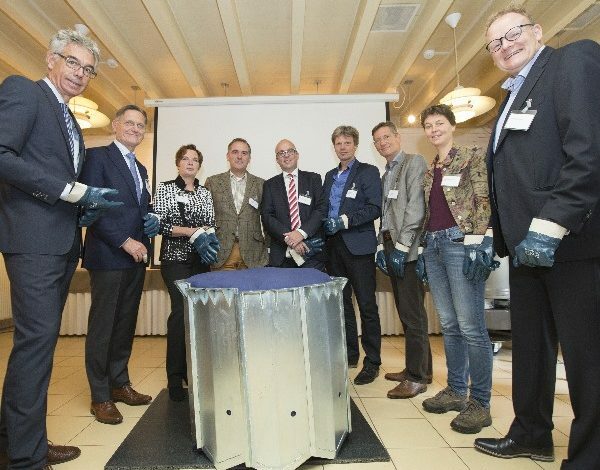 De openingshandeling van het meetsysteem door bestuurder van het consortium. Van links naar rechts: Jelle Hannema (Vitens), Wim van Vierssen (KWR), Myriam van Rooij (KNMI), Seger van Voorst tot Voorst (Nationaal park De Hoge Veluwe), Frank Tillmann (Eijkelkamp Soil & Water), Giliam Roolant (Waterschap Vallei en Veluwe), Henk Wolfert (WUR), Margreet van Zanten (RIVM) en Joost Buntsma (STOWA).